The face of comedienne Lucille Ball, immortalized as Lucy Ricardo on the television program I Love Lucy, is said to have been seen by more people worldwide than any other. Known as "Lucy" to generations of television viewers who delighted at her rubber-faced antics and zany impersonations, she was a shrewd businesswoman, serious actress, and Broadway star as well. Born Lucille Desiree Ball on August 6, 1911, she and her mother, DeDe, made their home with her grandparents in Celoron, outside Jamestown, New York. Her father died in 1915 of typhoid fever, a sometimes deadly disease that spreads through milk or water. Along with her brother, Lucille was then raised by her mother and grandparents, who took her to the theater and encouraged her to take part in her school plays. Lucy's mother also strongly encouraged her daughter's love for the theater. The two were close, and DeDe Ball's laugh can be heard on almost every I Love Lucy sound track. 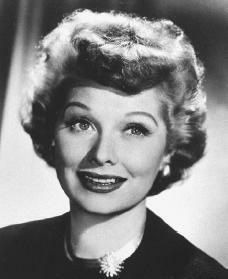 But from Lucy's first unsuccessful foray to New York, New York, where she lost a chorus part in the musical Stepping Stones, through her days in Hollywood, California, as "Queen of the B's" (grade B movies were known for their lower production values), the road to I Love Lucy was not an easy one. In 1926 Lucy enrolled at the John Murray Anderson/Robert Milton School of Theater and Dance in New York. Her participation there, unlike that of star student Bette Davis (1908–1989), was a terrible failure. The school's owner even wrote to tell Lucy's mother that she was wasting her money. Lucy went back to high school in Celoron. and returned to Celoron yet again, where her mother nursed her through an almost three-year bout with the illness. Determined, Ball found more success in New York the next time, when she became the Chesterfield Cigarette Girl. In 1933 she was cast as a last-minute replacement for one of the twelve Goldwyn girls in the Eddie Canter movie Roman Scandals, directed by Busby Berkeley. (Ball's first on-screen appearance was actually a walk-on in the 1933 Broadway Thru a Keyhole. ) During the filming, when Ball volunteered to take a pie in the face, the legendary Berkeley is said to have commented, "Get that girl's name. That's the one who will make it." Favorable press from Ball's first speaking role in 1935 and the second lead in That Girl from Paris (1936) helped win her a major part in the Broadway musical Hey Diddle Diddle, but the project was dropped after the premature death of the male lead. It would take roughly another fifteen years for Ball to gain stardom. Ball worked with many comic "greats," including the Three Stooges, the Marx Brothers, Laurel and Hardy, and Buster Keaton (1895–1966), with whom she developed her extraordinary skill in the handling of props. She gave a solid performance as a rising actress in Stage Door (1937), and earned praise from critic James Agee for her portrayal of a bitter, handicapped nightclub singer in The Big Street (1942). It was on the set of a small film, Dance, Girl, Dance, that Lucille Ball first met her future husband, Cuban bandleader Desi Arnaz (1917–1986). Married in 1940, they were separated for much of the first decade of their marriage because of Desi's travels. The union, also plagued by Arnaz's work schedule, alcohol abuse, and outside affairs, dissolved in 1960. Determined to work together and to save their marriage, Ball and Arnaz developed a television pilot (one show developed to sell to studios). Studio executives were not ready. The duo was forced to take their "act" on the road to prove its potential and to borrow five thousand dollars to found Desilu Productions. (After buying out Arnaz's share and changing the corporation's name, Ball eventually sold it to Gulf Western for $18 million.) It worked, and I Love Lucy premiered on October 15, 1951. Within six months the show was rated number one. It ran six seasons in its original format and then evolved into hour-long specials. It won over twenty awards, among them five Emmys, the highest award for television programming. The characters Lucy and Ricky Ricardo became household words, with William Frawley (1887–1966) and Vivian Vance (1909–1979) superbly cast as long-suffering neighbors Fred and Ethel Mertz. More viewers tuned in for the television birth of "Little Ricky" Ricardo than for President Dwight D. Eisenhower's (1890–1969) inauguration (swearing in as president). The show was the first in television history to claim viewing in more than ten million homes. It was filmed before a studio audience and helped revolutionize television production by using three cameras. The Lucy Ricardo character may be viewed as a downtrodden housewife, but compared to other situation comedy wives of television's "golden years," she was free of regular household duties. The show's premise was her desire to share the showbiz limelight with her performer husband and to leave the pots and pans behind. Later series featured Ball as a single mother and as a working woman "up against" her boss. Following her retirement from prime time in 1974 Ball continued to make many guest appearances on television. Broadway saw her starring in Mame (1974), a role with which she identified. (Her other Broadway appearance after her career had "taken off" was in Wildcat in 1960.) Her last serious role was that of a bag lady in the 1983 made-for-television movie Stone Pillow. Ball was married to comic Gary Morton from 1961 until the time of her death on April 26, 1989, eight days after open-heart surgery. She was survived by her husband, her two children by Arnaz, Luci and Desi Jr., and millions of fans who continue to watch her in reruns of I Love Lucy. Ball, Lucille, and Betty Hannah Hoffman. Love, Lucy. New York: Putnam, 1996. Brady, Kathleen. Lucille: The Life of Lucille Ball. New York: Hyperion, 1994. Morella, Joe, and Edward Z. Epstein. Forever Lucy. Secaucus, NJ: L. Stuart, 1986.